WHAT IS VIRGINIA HISTORY DAY? 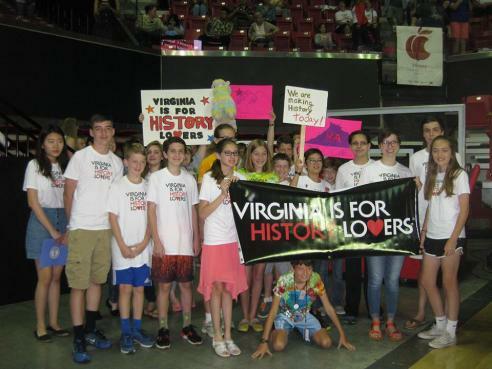 Virginia History Day is conducted in conjunction with the National History Day Contest. The first round of competition is held in the eight districts of Virginia. The top two entries in each category and age division at the district competition qualify for the state contest. Virginia History Day will take place on Saturday, April 21, 2018 at the Virginia Museum of History & Culture. View the 2017 Virginia History Day Photo Album on Facebook. The top two entries in each category and age division at the state competition qualify for the national contest, which will be held this summer. View the guide for choosing a category. Please register for your appropriate district contest on the district contest page. Make sure to register by the deadline and submit all signature forms and payment to the appropriate District Coordinator. Details will be on the registration form for each district. Note: You must have won 1st or 2nd place in your respective district to be eligible to compete at the state-level Virginia History Day contest. The paper and website deadline is Friday, April 7th at 11:59pm. All paper submissions must be e-mailed to virginiahistoryday@gmail.com. Websites will be locked out and unable to be edited after the deadline. Each participating student​ is required to submit a completed Virginia History Day Signature form and payment in order to participate in the Virginia History Day competition. Once you've completed the form you will receive a link to submit payment. The registration fee is $25 per student. One registration form per project entry. View a helpful guide for students and teachers regarding the website category.